It goes without saying that Nilorn UK is the go-to company for the highest quality woven labels, printed tickets and trims in the industry but our services don’t end there, we also add value to brands through quality packaging too. Two-part tube printed on uncoated stock. Kraft board box with custom shape wrap. Press-lock resealable foil bag for freshness. Flat pack pillow pack with added handle. Semi-opaque plastic wrap with screen print logo. Flat-pack jewellery box and carrier with foiling. Matt print t-shirt tube with pressed metal lid. Elegant fold flat carrier secured with ribbon. When it comes to packaging solutions, we are a world leader that offers a global supply chain on a huge range. Design and finish options are vast, spanning from bags in paper, plastic and fabric substrates to folding cartons and ridged boxes in most materials including board, metal and wood. All our products are bespoke to your specifications. 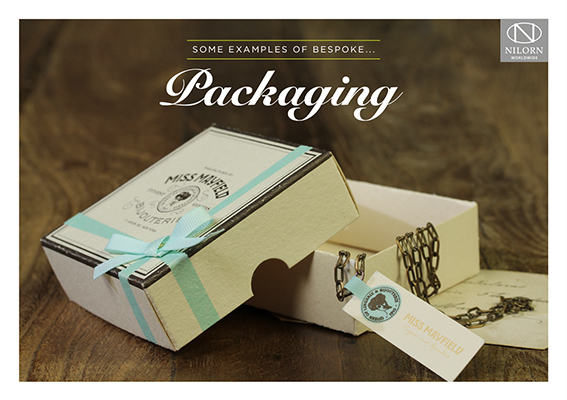 However if you are unsure of what you want, or are looking for some inspiration, please feel free to browse examples of our bespoke packaging in our digital brochure below. Still don’t see what you are looking for? Please contact us and one of our sales team would be happy to help you with your enquiry.